Princess Wilson, center, joins a demonstration in support of U.S. Catholic nuns outside the U.S. Conference of Catholic Bishops' biannual meeting on June 13, 2012, in Atlanta. American nuns are gathering in St. Louis, Mo., this week for their organization's yearly national assembly, where they are expected to discuss the future of their relationship with the Vatican following scathing criticism of the nuns' alleged lack of fidelity to Catholic teachings. This spring, after a three-year investigation, the Vatican's doctrinal watchdog issued a report questioning the organization's loyalty to some Church teachings, including the nuns' lack of outspokenness on issues such as gay marriage, abortion and contraception. Another concern voiced by the Vatican relates to conferences organized by the nuns featuring "a prevalence of certain radical feminist themes incompatible with the Catholic faith." This week, the nuns will discuss a range of options for the future, from accepting the Vatican's mandate to starting a new organization independent of the church's control. In an interview with NPR in July, Franciscan Sister Pat Farrell, president of the Leadership Conference of Women Religious, an umbrella organization representing about 80 percent of the nuns in the United States, said the organization is "not talking about the risk of excommunication or leaving the church." 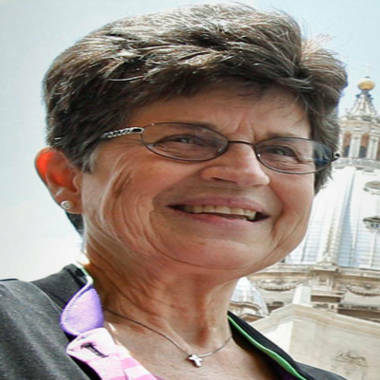 Sister Pat Farrell, president of the Leadership Conference of Women Religious. "The one and only underlying option for us is to respond with integrity with however we proceed," Farrell added. "Some of the options would be to just comply with the mandate that's been given to us. Or to say we can't comply with this and see what the Vatican does with that. Or to remove ourselves and form a separate organization." Earlier, in a June interview with the National Catholic Reporter, Farrell said the option to become an independent organization would stay on the table. "Again, that’s something we can’t respond to without further consultation with our members," Farrell said. "But the option always is there." On the question of submitting to the Vatican's appointed overseer, Farrell said: "Clearly this is an outside control. We would rather not have that." In a statement released just after the Vatican report, the nuns said the report had "caused scandal and pain throughout the church community, and created greater polarization." “Board members concluded that the assessment was based on unsubstantiated accusations and the result of a flawed process that lacked transparency,” the statement read. American Catholics are showing their support for the nuns, organizing vigils across the country to advocate for the end of the crackdown. The Nun Justice Project is one organization standing with the nuns against what they call "a prime example of how the hierarchy in the Roman Catholic Church misuses its power to diminish the voice of women." 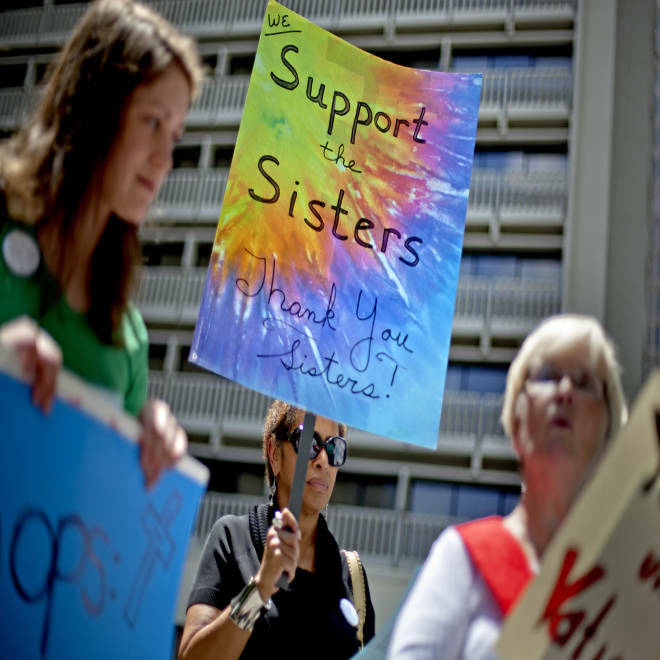 On Aug. 12, Nun Justice supporters are planning a flower march in support of the nuns in Seattle. According to a June 20 press release, "Catholics have already pledged over $61,000 at nunjustice.org to communities of women religious all over the U.S."
Nuns and their supporters have said that questioning the church's teaching is not the same as disobeying it. It is possible that no decision will be reached by the end of the assembly, but private sessions will give leadership a sense of the "leaning" of the group, Farrell said. The conference opens Tuesday evening and concludes Friday. Farrell is expected to speak at a press conference Friday afternoon.